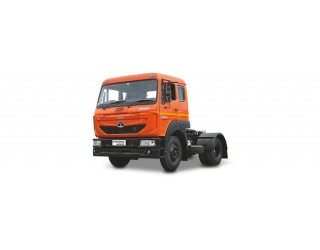 Nov 28, 2018: Being one of the top models in the Signa range of trucks from Tata Motors, the Signa 4018.S features a heavy duty appearance with a huge payload capacity of 34,230 kilograms for its 5,970 kerb weight. It has a wheelbase of 3,200 mm, which contributes to having a low turning radius of 6,150 mm. The day cabin on the chassis is quite feature-rich with the addition of power steering, telematics, navigation system, and a driver’s information display. Air conditioning is offered too, but only as an option. Coming to the braking, the air brakes are given the added benefits of ABS, though parking brakes are not offered. Powering the truck is a 5.9-litre 6-cylinder engine that can churn out a maximum power of 180 bhp at 2,500 rpm and a peak torque of 700 Nm at 1,500 rpm. A 6-speed manual unit does the transmission duties under the hood. The Tata Signa was first introduced at the SIAM Auto Expo back in 2016 and later on, it was launched with a lot of variants The Signa range of trucks is built for the medium and heavy commercial category. The Tata Signa 4018.S comes with a newly designed exterior and there is also a host of new interior equipment. The cabin space is designed smartly and the NVH levels, as well as the ergonomics of this truck, are also improved. The vehicle comes with a superior experience inside the cabin with the AC and Ventilation options. These will make a comfortable environment for the driver while on a long drive. The engine is quite good and offers a decent amount of power and torque. The addition of the ABS enhances braking efficiency more. The brief information of the Tata Signa 4018.S is mentioned below, that will give you a clear idea about the truck. The Tata Signa 4018.S is equipped with a 5.9-litre, Cummins ISBe engine. The BS-IV compliant engine is capable of pumping out a maximum of 180 hp power, which comes at 2,500 rpm. The peak torque is 700 Nm which comes at 1,500 rpm. The engine is paired with a 6-speed manual gearbox and it is also assisted by a single plate dry type clutch of 380 mm. It can achieve a top speed of 80 kmph, which is pretty decent for a truck in the heavy-duty segment. The Tata Signa 4018.S has a boxy body at the back which is used for carrying cargos. Along with this, it has a day cabin up front where the driving crew can take the seat. The truck has an overall length 5,625 mm and the width is 2,565 mm. The gross vehicle weight (GVW) is 40,200 kilograms, which makes 5,970 kg of kerb weight and 34,230 kg of payload capacity. It has a fuel tank of 400 litres that helps the driver to drive with no worries for refuelling in a long way. The inclusion of power steering helps the driver to manoeuvre more conveniently while driving. Whereas, taking U-turn or changing the lanes is not a major issue for this truck, thanks to the turning radius of 6,150 mm which is pretty good for this vehicle. The Tata Signa 4018.S is capable of carrying heavy loads, and it can drive on the highways easily. Moreover, the truck comes with an off-road gradeability of 18%, which makes the truck able to drive on the challenging roads with ease. Also, climbing on a bridge will not be a hassle for the driver due to the decent gradeability. Coming to the suspension, parabolic leaf springs are present up front axle of this truck and at the rear, there are semi-elliptical multi-leaf springs. The suspension makes it able to perform well, especially on the bad roads. The Tata Signa 4018.S comes with air brakes, which are further assisted by ABS (Anti-lock braking system). This helps to enhance the efficiency of the braking and provide good stopping power to the vehicle. Also, these brakes are effective to stop the vehicle at high speeds. Speaking of the safety features, the vehicle comes with seat belts for both the driver and the co-driver. However, it neither gets the parking brakes nor the fog lights, which are a great disappointment for this truck. The Tata Signa 4018.S gets a heavy-duty truck-like design like others in this category. The headlights are placed on the front bumper. The vehicle is built on a wheelbase of 3,200 mm. The loading capacity of the vehicle is quite good, in comparison to other models in this segment. The vehicle comes with a lot of quality features inside the cabin. The cabin comes with AC as optional, which is a welcoming feature in terms of comfort. Moreover, the navigation system, a driver information display and telematics are also provided inside this truck. The dashboard design of the vehicle is good, and it consists of an advanced instrument cluster. The three-way adjustable mechanically suspended seats are provided, that take care of the comfort. Also, the interior gets a cockpit type touch with dual tone. The control panel of the vehicle looks elegant where the switches are ergonomically positioned.